The field proven Rugged Systems™ Power Distribution Unit (PDU) line is ideally suited for military, industrial and telecommunicationsapplications requiring a rugged rack, vehicular or field deployable, high reliability, compact size and light weight design. The rounded metal corners aid in safe handling. Internally, all major components are well secured and electrically insulated to prevent damage due to shock and vibration. All controls and protective devices are brought to the front panel. Further, all front panel devices are recessed with critical switches orbreakers guarded to prevent damage or accidental operation. ETI offers as part of its PowerStation line, individual branch circuit control. 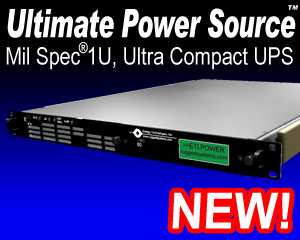 The Power Distribution Units (PDU) can be integrated as part of the UPS unit or as separate modules. Each of the PowerStation UPS products offers up to six (6) branch circuits integrated into the UPS module with individual circuit protection and power outlets. The circuit protection can be breakers, fuses or switches. The power outlets can be standard, twist-lock or military receptacles or terminal blocks. If more than six (6) circuits are needed, the PowerStation PDU Module can provide up to sixteen (16) circuits in groups of four (4). Custom configurations are also available. In conjunction with the PDU functions (in either the UPS configuration or the separate PDU Module), each of the individual circuits can be remotely controlled ON or OFF. External dry contacts are connected via a second DB-25 connector to control these circuits. This optional function is extremely useful in applications requiring remote control of loads or safety interlock features (de-energize equipment when racked out). The low energy 5 VDC logic and encapsulated solid-state power relays are safe for almost any environment. As a further enhancement to the Distribution Load Control, the Selective Load Shedding feature allows the user to select less critical loads that can be shed during a power outage to extend the battery reserve time for the more critical loads. Distribution Load Control is equipped with an optional two-stage thermal shutdown feature. The sensors can be mounted in the equipment racks or remotely. The first stage turns ON an LED indicator and generates an audible alarm and the second stage will shed either selected or all connected loads. This function is useful in uncontrolled or remote environments. The PowerStation UPS is available with a Dual Source Input with Input 1 as the primary source and Input 2 as the alternate source. If Input 1 fails, the unit automatically transfers to the secondary source, Input 2. When Input 1 returns to normal, the unit automatically returns to that source. The Dual Source Input option is available with either the standard UPS configuration or with the Power Conditioning Only option providing an added degree of reliability to critical loads.